I feel the guard breach my mind, searching for the lies within. Satisfied, he checks the list and nods. I slip past, but after a few steps, I hear a commotion behind me. I don’t think. I just run. It’s like a mini movie! Yes, great choice on the title. I think that’s what helps this piece stand alone from the longer fiction work. It’s a nice companion, but it has its own legs. Thank you, Cyn! I was worried it wouldn’t work on its own, but it was fun connecting the two! Oooo…a bit of intrigue! I hope she got away. Me too! Haha – Thanks for stopping by and reading! Yes, I liked this and the fiction piece. Great drama created in such a few choice words. Nice job making this stand alone! The world-building hints are excellent. Cyn stole my comment. 🙂 This is a nice strong piece with all the necessary elements of a story: characters, conflict and action. Really awesome. 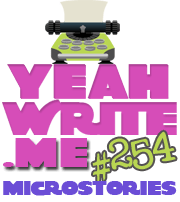 I was struggling with this week’s microstory prompt but you did it brilliantly. So much said in so few words.